A pre-Hopalong Cassidy William Boyd is the robust star of this logging camp melodrama which also featured a very young Ginger Rogers -- who performs Bernard Grossman and Harold Lewis' "How Could I Love You" -- and Hollywood veteran Hobart Bosworth. The latter plays Jim Gannon, a lumberjack boss whose son Buck (Boyd) is neglecting his duties in favor of romancing riverboat entertainer Honey (Rogers). Father and son come to blows but their animosity ends after Buck rescues Jim from a runaway logging train. 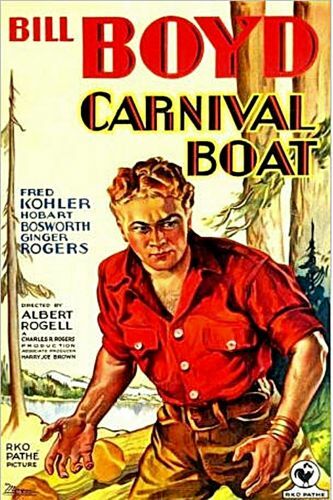 Feeling left out, Honey plans to leave with the carnival boat but decides to stick around after violence erupts at the hands of villainous lumberjack Hack Logan (Fred Kohler). Carnival Boat was filmed on location at Big Pine, CA.